Internet search giant's Chinese partner has remained silent during and after the dispute with the government. Why? It's been months since the intense dispute between Google and Chinese government came to an end, with the Internet search giant redirecting its traffic from Beijing to Hong Kong, still there are many questions left unanswered, namely has Google really left and why was its partner in China so silent during the quarrel? It's been widely publicized that a Jan 12 statement by David Drummond, Google senior vice president and chief legal official, started it all. In the statement, he claimed that the Internet giant, based in the Silicon Valley in California, had been heavily attacked by hackers on the mainland and was weighing whether to jump ship from Beijing. The incident escalated after Drummond published another statement on March 23, saying the company would no longer filter search results on Google.cn and would redirect traffic to Google.com.hk. During the war of words between the government and Google, the co-investor of Google.cn - an unnamed Beijing information technology company - was completely mute as the controversy unfolded. 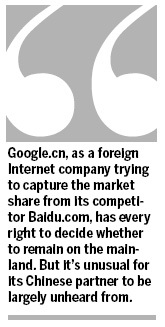 Google.cn, as a foreign Internet company trying to capture the market share from its competitor Baidu.com, has every right to decide whether to remain on the mainland. But it's unusual for its Chinese partner to be largely unheard from. Was the Chinese partner completely supportive of its foreign partner's decisions during the situation? Or is it Google's puppet? After it was officially launched in January 2006, Google.cn was enmeshed in one of its first disputes with China. According to Chinese laws and rules, all foreign websites must obtain the Internet Content Provider (ICP) license from the government before conducting business in China. Only with this ICP license can commercial websites engage in advertising and provide paid information services, e-commerce and other application services. Google.cn, however, had no such license when it began operations on the mainland. It was sharing the same license as Ganji.com, run by the unnamed Beijing information technology company. After the media exposed its unlicensed operations, the government suspected that Google.cn lacked legal access to the Chinese market. Here is where the Beijing IT company comes into play. To acquire its own ICP license and legitimize its operations in China, Google established a joint venture company - Beijing Guxiang Information Technology Co Ltd - with the IT firm that runs Ganji.com. The move brought Google in line with China's Internet regulations, which states that all foreign companies can only acquire a license by partnering up with a Chinese company. By setting up Beijing Guxiang Information Technology Co Ltd, Google.cn managed to secure a legal license. But according to Internet observers Wang Junxiu and Liu Xingliang, the establishment of the shell company allowed Google to expedite legal access into the Chinese Internet market. It's also been reported that Yang Haoyong, the legal representative and general manager of Beijing Guxiang Information Technology Co Ltd, has inseparable links with Google.cn. The Yale University-educated employee once worked in the Silicon Valley after graduating in 2001 and returned to China in December 2004 to jumpstart Ganji.com. In an online program on June 13, 2007, Yang admitted the intimate ties with Google. "I have remained in contact with the world's Internet search giant since the end of 2005 and a kind of strategic cooperation was set up in 2006. Now our cooperation has become increasingly expanded," he said. "We now depend on Google for its help and support." Yang ceased to be Beijing Guxiang company's board chairman and legal representative in its personnel reshuffling. All of the company's senior staff members reportedly have close connections with Google.cn. The pro-Google stance of the Beijing Guxiang company and its senior employees could best explain the unanimous silence among the Chinese partner in its dispute with the Chinese government. According to Internet observer Liu Xingliang, Google's exit does not mean that the search giant has completely left the mainland, which boasts the world's largest population of Internet users. Besides redirecting its mainland users to Google.com.hk, the company has not made any substantial steps toward saying goodbye to the mainland. Its mainland-based servers have not been moved out and the five companies that Google.cn invests in are still planning to stay on the mainland without any intention of leaving. The authors are China Youth Daily journalists. Through exemplary hard work and perseverance, Lu Qin, 39, is now the owner of a major chain of pedicure salons nationwide.